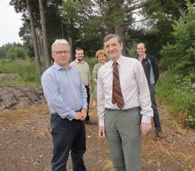 Active across the FORESTRY and BIO-ENERGY sectors, Andrew Nicol Chartered Forester delivers consultancy and management services to woodland owners and investors. We bring our knowledge and experience of natural ecological processes to the provision of sustainable resource management. A privately owned professional business, well known as “mud on boots” practitioners, we offer bespoke packages tailored to meet our client’s requirements. The business started in 2000 and our clients now span the private, public and charity sectors. Andrew Nicol Chartered Forester operates from custom built timber offices heated by a wood pellet fuelled district heating system. These are rurally located at the Deeside Activity Park, near Aboyne, Aberdeenshire. 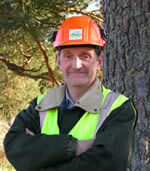 ANDREW NICOL is an Aberdeen University Graduate in both Forestry and Land Economy. Well known throughout Scotland’s forest and wood energy sectors, Andrew applies his lifetime’s professional knowledge and experience of the timber industry to the management of his clients’ forest, woodland and timber resources. In July 2014 Andrew Nicol Chartered Forester joined forced with RTS Forestry. RTS Forestry now shares Andrew's office in Dess . This gives woodland owners access to an established team of forest managers that provide a wider scope of services from planning and planting to thinning and felling. Graduating in Zoology Honours at Aberdeen University, JENNIFER BRODIE provides business development support to facilitate marketing and communication. CLAIRE SHEPHERD from local accountants The Grant Considine Partnership provides office support and masterminds the accounts, administration, statutory returns and record-keeping.